On our week long roadtrip for Eliana's spring break we went from Salzburg, Austria to Munich, Germany and then finally to the Bavaria region of Germany and Austria. 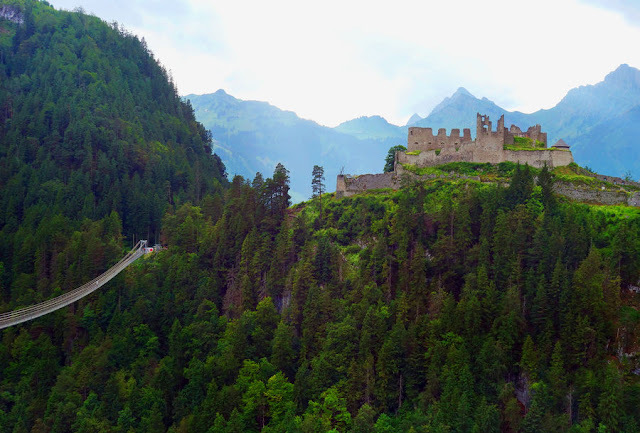 While in Bavaria we visited 2 of "Mad" King Ludwig's castles and 1 castle ruins from a different time. Of King Ludwig's castles we saw his most famous Neuschwanstein Castle that is said to be the castle that Walt Disney used as it's inspiration when building Cinderella's Castle in Disney World. 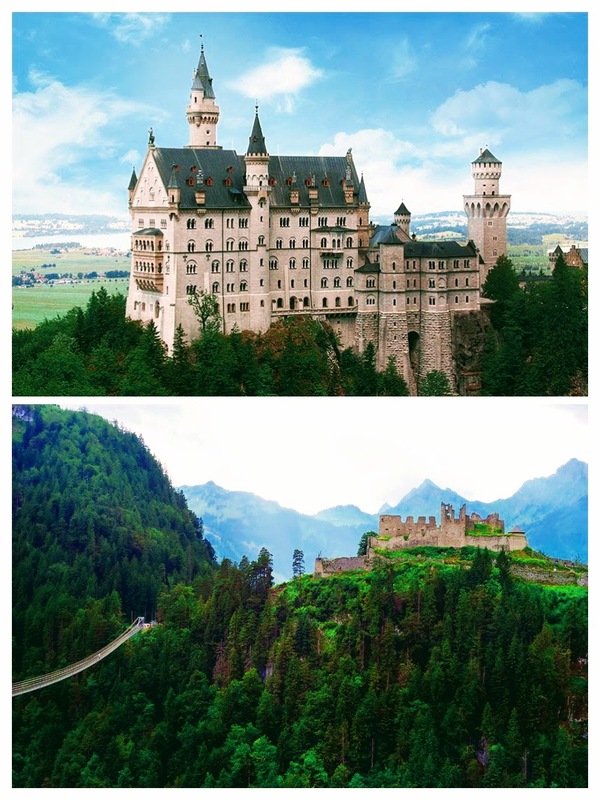 We toured both of King Ludwig II's castles in the same day. First, Hohenschwangau Castle, which is the castle where King Ludwig grew up and spent his childhood Summers. The castles are set very near to each other and can be visited in the same day. We took a guided tour of both (each lasting about a half hour) and used the horse drawn carriage to deliver us between the two. We stayed in a beautiful hotel in one of their family rooms. The room had two rooms - a bedroom and a sitting room with a pull out couch. The sitting room also had a balcony that overlooked the mountain and Neuschwanstein. We ordered a bottle of wine from the hotel bar and sipped our wine while enjoying the view. The castle is lit up at night in the mountains. The hotel included a full breakfast and was walking distance to the castles and the tiny town below it. There was also a small playground for the children on the hotel property. The town just below the castles consists of a few restaurants, several hotels and souvenir shops. The street around the hotel and near the town are all countryside with a small white church set in a picturesque area. Other than the castles there is not much else to do here in this town. We stayed for two nights at the hotel. The first, we arrived in time to have dinner at a local restaurant and enjoy some time on our balcony hotel room looking at Neuschwanstein Castle prior to dinner and then after dinner when it was lit up. The second day we spent visiting the castles and then let the children play on the hotel playground before heading to a different restaurant that had an outdoor child climbing set and small indoor playroom for children. The next morning we drove to a third castle about 30 minutes away - Ehrenberg Castle. 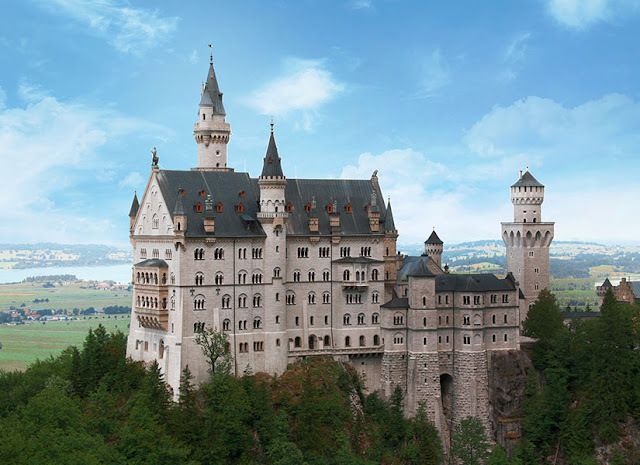 While Neuschwanstein Castle is the quintessential picture of a fairty-tale castle, Ehrenberg Castle is more or less ruins from Medieval times. The two castle tours offer very different experiences. Neuschwanstein is a little girl's princess dream castle. While Ehrenberg is a little boy's knight dream castle. While visiting Neuschwanstein you are told several times not to touch or take photos while inside. However Ehrenberg castle is very hands on and has multiple stations where children can try on a knight's attire, feel (and climb on) real cannonballs, and watch movies that give a background on the castle and what it was like living in this era. Ehrenberg castle also has a large medieval styled playground outside and a long suspension bridge that allows those adventuresome enough to cross an old trade route 300 feet below.